Tax compliance isn’t for the faint of heart these days. Proper execution can directly affect cash flow, the defensibility of tax return positions, risk management, and ultimately the public’s perception of your company as a responsible taxpayer. In the face of these concerns, as well as ever-changing tax laws and regulations and shortages of tax talent, the important business of compliance has become increasingly complex and automated. No wonder that a growing number of global companies each year choose to outsource their tax compliance activities, including U.S. corporate income tax. If you are considering outsourcing, it is critical to prepare for the changes needed to optimize your outsourced tax operating model, including the choice of software and advisors. Outsourced compliance, when done strategically, may offer both quantitative and qualitative benefits, enabling tax departments to focus on planning, risk management, and better reporting. A well-designed request for proposal (RFP) is key to preparing to outsource. It can help you scope and prioritize many areas of importance unique to your company beyond the tax returns that must be filed and deadlines that must be met. When developing the RFP, you should avoid tunnel vision, i.e., focusing solely on the mechanics of traditional “lift and shift” outsourcing and neglecting other critical elements of your tax operating model. Instead, the RFP should rely on a holistic understanding of your current tax operating model—your data, technology, processes, people, and governance model—as well as a forward-looking vision of where your tax department will be in three to five years. This approach will help you better meet your compliance obligations while supporting your tax department’s role as strategic advisor and contributor to the broader enterprise. What checklist items can lead to a pitch-perfect RFP? Start with a clear vision of what you want your tax department to be and do, then determine how outsourcing can support that vision. Most companies evaluate various approaches to compliance during this planning process, including transformation of in-house return preparation, collaborative sourcing of return preparation, lift and shift outsourcing, and outsourcing that includes rebadging compliance personnel. It is important to consider all these strategic options, which center on the human element but are all technology-enabled. With the big picture in view, you can identify your most significant compliance challenges and incorporate those requirements into your RFP. Doing this pre-release can make for a clearer, more concise RFP whose scope aligns with your vision. Data and Technology: You Say You Want a Revolution? One of the most time-consuming and important areas to address in the RFP is tax data management. Your company will be responsible for data quality in the outsourcing relationship. Your service provider will need access to source trial balance data and details of many accounts for all legal entities. This can be a significant challenge depending on the number of ERP instances, the structure and level of detail of the chart of accounts, the purity of legal entity accounting, and whether local statutory accounting ledgers are maintained. In many cases, companies use a tax data collection package to compile tax compliance data from local country controllers or regional tax personnel. The service provider will need access to this data to prepare tax returns. Given the complexity of most ERP and other financial systems that support tax compliance, you should determine up front which types of information are needed, where that data resides, what business rules apply to it, and what effort will be required to transform the data into a return-ready format. Because many compliance inefficiencies stem from inaccurate or incomplete data, it is critical to streamline and standardize the data collection, including non-ERP data, to ensure that the service provider has the information needed to prepare tax returns. Conversely, you also need to confirm that the service provider will make tax return information available to your company for tax planning purposes and to understand how it will be gathered, prepared, and delivered. Access to and exchanging timely, consistent, and accurate tax data are not the only key aspects of communications among the broader enterprise, your tax department, and the service provider. How will document management, tax return reviews, and other collaborative activities be handled? Will your service provider offer a tax portal to facilitate collaboration? Can the portal be integrated with a central data repository containing common data for tax purposes so meaningful reports, work flow, and dashboards can be generated? 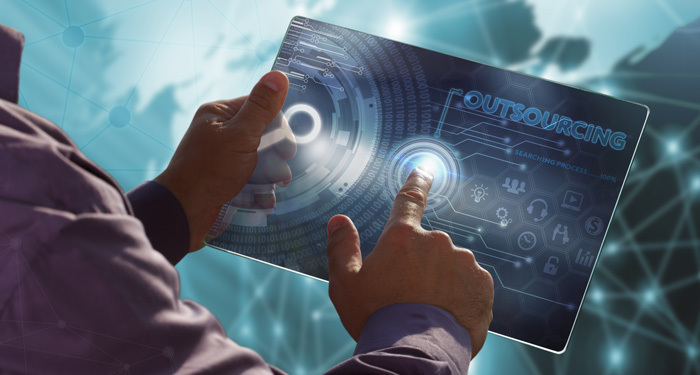 Robotic process automation (RPA), machine learning, cognitive computing, and blockchain applications are rapidly evolving technologies that a tax department may be able to access through outsourcing. RPA uses a macro concept to automate repetitive computer processing and can greatly increase efficiency of low value-added processes. Machine learning and cognitive technologies add “intelligence” to processes by emulating and amplifying human decision-making. Blockchain is an open, distributed ledger technology that facilitates transactions between parties and can generate transactions automatically. Does your service provider incorporate these technologies into its processes? If not, what plans are in place to do so? If you might bring compliance back in-house in a few years, how can the service provider help you gain access to these and other capabilities? Tax analytics is another important capability that can help your organization gain insight into tax filings, such as estimated payments, extensions, and annual return filings. With specific tax data analytics, you can perform tax benchmarking, trend analysis, and predictive analysis to gain deeper insights into tax processes and profiles and become more forward-looking and strategic. How can your service provider help you gain these valuable insights? Processes: Come Together, or Go Your Own Way? How do your end-to-end accounting and tax compliance processes currently work? Will your outsourcing provider be able to navigate these processes to obtain required data? For example, in the order-to-cash cycle, what transaction details are used for indirect tax reporting, income tax apportionment, and country-by-country localization reporting? In the purchase-to-pay cycle, what recoverable/non-recoverable indirect taxes (as well as any related self-assessment) and reverse charges are associated with accounts payable (A/P) transactions? In order-to-cash and purchase-to-pay processes, what “bolt-on” systems feed your ERP system(s), and what calculations are performed outside of the ERP system? Understanding these details will help you decide where and how the service provider will have access to these systems and the data needed for compliance activities. Disparate, disjointed compliance processes commonly lead to the failure of outsourcing engagements. You cannot lift and shift inefficient processes and expect better outcomes from a service provider. Can your service provider first help you standardize processes? If a process can’t be standardized, what will the workaround be, and how will it be reconciled with other standard processes? Will the service provider centralize resources and processes or disperse them into different locations? Are you planning for effective data synergies? Many companies are weighing the scope of tax provision and local country statutory reporting work to be included in the outsourcing arrangement. Efficiencies can be gained by leveraging tax return calculations and tax payment information to make return-to-provision adjustments and support footnote and country-by-country reporting disclosures. Also, tax basis balance sheets should be considered as possible outsourcing deliverables, since tax basis is determined using information from tax returns. From an internal controls perspective, annual or more frequent tax basis balance sheets can give a company greater confidence in the tax balances reported in its financial statements. They are also key to determining the book and tax gain/loss of mergers, acquisitions, and spinoff transactions. Another area of synergy is between tax compliance and transfer pricing. With the adoption of the new transfer pricing documentation pursuant to BEPS Action 13, tax return positions should be easily reconcilable to the country-by-country report and the local files of foreign entities, as this will likely be requested upon audit. Harmonizing these areas can produce a wider and deeper knowledge base, create consistency across the various external filings, and save costs due to shared information inputs and outputs. Many companies now use finance and accounting shared services centers or global business services organizations. If your company has a shared services center, your outsourcing service provider will need to obtain information from it. How and where will these handoffs occur, and who will be responsible for them? These are especially important questions if the shared services center is offshore. Coordinating communications and information flow among headquarters, the shared services center, and the outsourcing service provider will be critical. One of the most time-consuming and important areas to address in the RFP is tax data management. Your company will be responsible for data quality in the outsourcing relationship. People: Should We Stay or Should We Go Now? In the face of growing scrutiny from governments and capital markets, changing expectations of internal stakeholders, and increased reliance on automation and analytics, the staff in your tax department will need stronger technical and business expertise, such as in data analytics and communication, instead of compliance knowledge. How do you plan to help them develop new skills and ways of thinking? Does your current staff have the potential and desire to upgrade their skills in these areas? The decision to outsource presents an opportunity to reconsider where in-house professionals “sit” going forward. Will they be onshore, or can your department benefit from nearshore or offshore talent? What will be the mix of permanent, full-time resources as opposed to temporary, contract, or part-time resources? If you are trying to align more closely with global finance and accounting functions, could resources be moved to existing shared services centers, global business services organizations, or centers of excellence? Will a service provider consider offering staff affected by the outsourcing the opportunity to keep working with their current company in an outsource role and introduce new career opportunities? This is commonly referred to as outsourcing with a rebadge of certain critical company compliance personnel. An outsourcing arrangement is likely to involve regional teams of compliance personnel. What mechanisms will be in place to keep these teams aligned with your company’s global compliance goals? Will you have visibility and control across your entire tax footprint? Robotic process automation (RPA), machine learning, cognitive computing, and blockchain applications are rapidly evolving technologies that a tax department may be able to access through outsourcing. Determining accountability is crucial. Will there be multiple points of contact on each side of the relationship, or only one? Will one contract or several govern the relationship? What expectations of responsibilities exist on both sides? How will change orders be processed and executed? An effective practice is to create a responsible, accountable consult and inform (RACI) matrix so all parties understand their roles and responsibilities in the end-to-end processes being outsourced. As more tax authorities globally share taxpayer information and enforce new rules aimed at getting their fair share of the tax pie, tax scrutiny and risks will likely increase for multinationals. When you outsource, how will you maintain transparency, and with what communications protocols in place? When issues arise, what will the escalation process be? Who will be responsible for addressing them, and how? What are expectations for calendaring and reporting, and how will they be met? What role will the service provider play in supporting your company’s audit defense process? The global tax compliance environment is changing constantly and rapidly. What communications structure will the service provider use to keep you apprised of material tax issues that arise, as well as changing tax laws, regulations, rulings, and court cases? How will in-scope and out-of-scope issues be identified and addressed? What is the provider’s approach to continuous process improvement? As you develop the RFP, consider now how you will measure the return on your tax department’s investment in outsourcing. What financial measures will you use? A few examples include addressing the global tax burden and understanding effective tax rate drivers; anticipating and planning for earnings per share effects of tax; reducing cash taxes paid; managing and clearly communicating risks; and prioritizing and addressing special-focus items such as mergers and acquisitions transactions and spinoffs. What organizational measures will be in place? Examples include meeting cost, quality, and service delivery goals; delivering effective training and career development; and retaining (and in some cases retraining) key personnel and leveraging succession planning. The implications of outsourcing tax compliance, particularly in a global company, reach far beyond the tax department. In addition to improving tax compliance, tax operations, and tax risk management, an effective outsourcing arrangement can provide the impetus for tax transformation efforts, especially in repositioning tax to partner more effectively with the C-suite, the board, and the business units. It can also reinforce broader finance transformation efforts and help deliver valuable information for financial planning and reporting. For these reasons, the choice of an outsourcing service provider and the specifics of the planned arrangement rely on a clear, detailed understanding of your current and envisioned tax operating model. How do your data, technology, processes, people, and governance models currently work together? What existing bottlenecks could affect the tax provision, tax return filings, and tax and financial reporting domestically and in other countries? What are your expectations of the outsourcing relationship, and how do they align with your organization’s global tax goals and, more broadly, other business goals and strategies? Thinking through the issues presented in this article and brainstorming them with key stakeholders across your organization, as well as with your tax advisor, can help you develop an RFP that sets the stage for an effective outsourcing arrangement. Amanda Hale is a tax managing director and Jen Deutsch is tax partner at Deloitte Tax LLP. Nathan Andrews, tax partner, and Bob Norton and Bob Westgate, tax specialist leaders, also contributed to developing this article.